Scientists from the Washington State University (WSU) have developed a sustainable substitute to traditional concrete using coal fly ash, which is a waste product of coal-based electricity generation. The development tackles two big environmental issues at once by utilizing coal production waste and by considerably decreasing the environmental impact of concrete production. 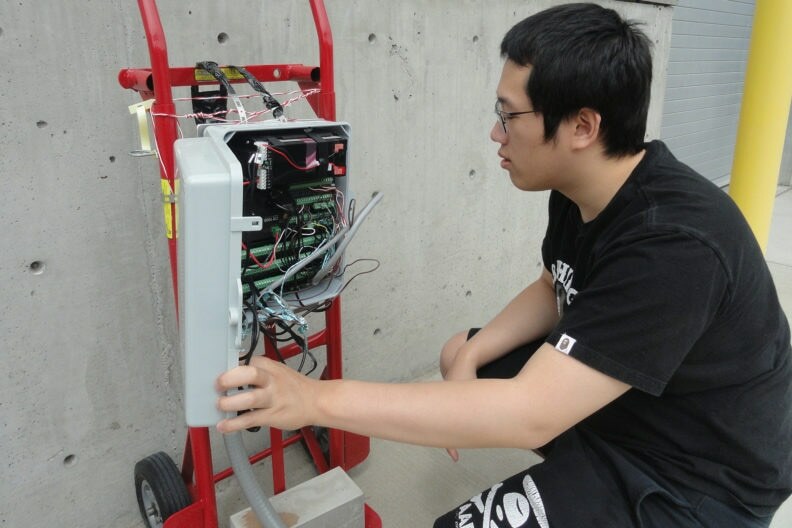 Xianming Shi, associate professor in WSU’s Department of Civil and Environmental Engineering, and graduate student Gang Xu, have created a strong, durable concrete that uses fly ash as a binder and excludes the use of environmentally intensive cement. Details of their work can be found in the August issue of the journal Fuel. Manufacture of traditional concrete, which is made by incorporating cement with gravel and sand, contributes between 5-8% greenhouse gas emissions globally. The reason is that cement, the main ingredient in concrete, requires high temperatures and an incredible amount of energy to manufacture. Fly ash, the residue that remains after coal dust burns, now has become a major waste management issue in the United States. Over 50% of fly ash gets dumped into landfills, where it can easily leach into the neighboring environment. While some scientists have used fly ash in concrete, they have not been successful in eliminating the intense heating techniques that are traditionally required to create a robust material. This work is also noteworthy because the scientists are using nano-sized materials to design concrete at the molecular level. To sustainably advance the construction industry, we need to utilize the ‘bottom-up’ capability of nanomaterials. The team used graphene oxide, a newly discovered nanomaterial, to regulate the reaction of fly ash with water and turn the activated fly ash into a robust cement-like material. The graphene oxide rearranges molecules and atoms in a solution of fly ash and chemical activators like calcium oxide and sodium silicate. The process forms a calcium-aluminate-silicate-hydrate molecule chain with sturdily bonded atoms that create an inorganic polymer network more durable than (hydrated) cement. The WSU team engineered the fly ash concrete to be pervious, which means water can seep through it to replenish groundwater and to lessen flooding potential. The researchers have shown the material’s strength and behavior in test plots on the WSU campus under different temperature and load conditions. They are still performing infiltration tests and collecting data using sensors placed under the concrete. They finally hope to market the patented technology. The study was financed by the U.S. Department of Transportation’s University Transportation Centers and the WSU Office of Commercialization.